Adams to publish peace process cook book – Because in this game of life the more you know the better player you will be. Many politicians publish books during their careers, but Gerry Adams has gone one step further – by announcing he is to publish a cookery book. It is expected to be printed before Christmas and will be called The Negotiators’ Cook Book, he said. 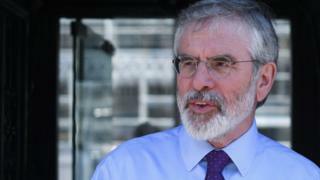 The former Sinn Féin leader said it would contain recipes with “some of the best-kept secrets” of the 1998 peace process. He gave details of it during a talk at a festival in west Belfast on Monday. Mr Adams later tweeted a photo of the cover of the book. The Irish Times reported that the politician, who still represents County Louth in Irish Parliament (Dail), told an audience that Sinn Féin had been “blessed” with several cooks who helped feed the team during lengthy negotiations in the lead-up to the 1998 Good Friday Agreement. The peace deal helped to end 30 years of violence in Northern Ireland. “The British never fed us, they never had any food,” he said. “But as intrepid republicans and being blessed by one or two great cooks these are the recipes that sustained the Irish negotiating team. Sinn Féin has confirmed that it will be publishing the book in the next few months. Mr Adams appears to be a keen amateur chef himself, often tweeting pictures of his own attempts in the kitchen. He has already published a number of books including memoirs and historical works, and is also expected to release a new book of short stories next year, which he said has been five years in the making.